The United Nations 2030 Sustainable Development Agenda commits us to “leave no one behind”, while the International Labour Organization’s goal of “Decent Work for All” embraces the same principle. Today, we find ourselves at a pivotal point in history to make this happen. I see the global political developments of the last few months as a revolt of the dispossessed, of people – workers – who feel they haven’t benefited from globalization. Every generation hopes and dreams that it will be better off than the previous one, both professionally and as a society as a whole. For many, this dream has been thrown into reverse. And I think their frustration and disillusionment are very much generated from people’s experience of work, whether that’s their exclusion from work, or their insertion in labour markets in conditions which they find unacceptable. The societies we all live in are distributing the benefits of globalization and economic processes extraordinarily unfairly. It is a well-documented fact that since the 1980s and 1990s, for example, wage inequality has increased in many countries around the world. 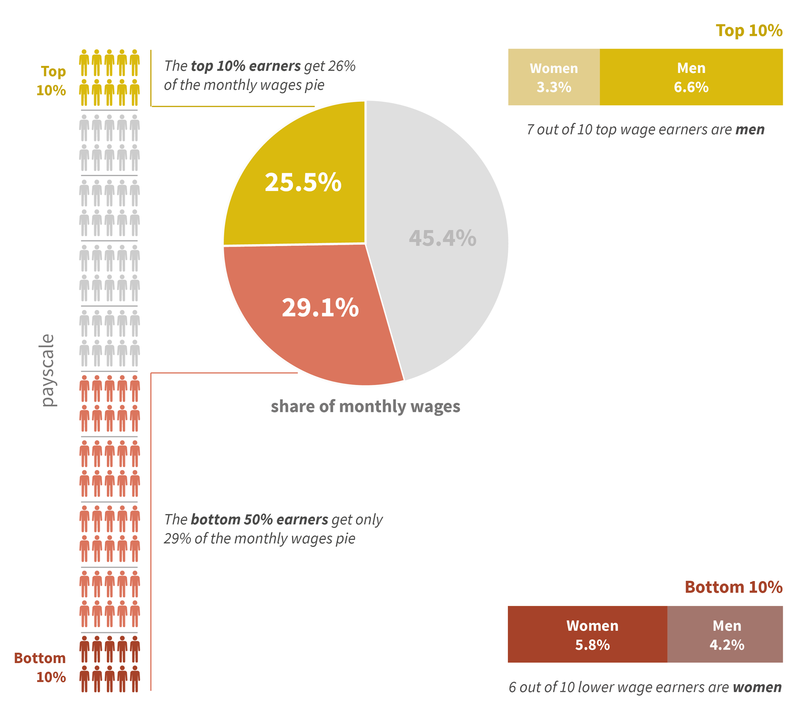 The ILO’s Global Wage Report, Wage Inequality in the Workplace , published last month, shows that in most countries wages climb gradually across most of the wage distribution and then jump sharply for the top 10% and, even more, for the highest-paid 1% of employees. In Europe, the top 10% of best paid employees take on average 25.5% of the total wages paid to all employees in their respective countries, which is almost as much as what the lowest-paid 50% get (29.1%). The share of the top 10% goes even higher in some emerging economies, for example Brazil (35%), India (42.7%) and South Africa (49.2%). In Europe, the top 1% earn about 90 euros per hour, which is 8 times more than median wage earners, and 22 times the average wage of the bottom 10%. Overall, wage growth around the world has decelerated since 2012, falling from 2.5% to 1.7% in 2015, its lowest level in four years. If China, where wage growth was faster than elsewhere, is not included, growth in global wages dropped from 1.6% to 0.9%. We also face the twin challenge of repairing the damage caused by the global economic and social crisis and creating quality jobs for the tens of millions of new labour market entrants every year. Economic growth continues to disappoint and underperform – both in terms of levels and the degree of inclusion. This paints a worrisome picture for the global economy and its ability to generate enough jobs, let alone quality jobs. Persistent high levels of vulnerable forms of employment combined with clear lack of progress in job quality – even in countries where aggregate figures are improving –are alarming. We need to ensure that the gains of growth are shared in an inclusive manner. The number of unemployed persons globally in 2017 will stand at just over 201 million – with an additional rise of 2.7 million expected in 2018 – as the pace of labour force growth outstrips job creation, the ILO’s World Employment and Social Outlook - Trends 2017 (WESO), forecasts. We need economic growth that is sustainable and job-rich. Such growth can only be lasting and equitable if it is built on the foundations of strong and relevant labour market institutions, which themselves are founded on internationally-accepted principles and rights that underpin better quality work. Minimum wages and collective bargaining can play an important role in this context. One striking trend of the last few years has been the fact that because of increasing inequality many countries have adopted or strengthened minimum wages. Several countries have recently decided to increase their minimum wages, including most recently Mexico, while others, like South Africa, are considering introducing national minimum wages. Recent evidence, including by the Minimum Wage Commission in Germany, shows that well-designed minimum wages - set at levels that take into account the needs of workers and their families and also economic factors - can make a real difference at the lower-end of the distribution without significantly harming employment. Access to decent work opportunities for all is the most effective way to lift people out of poverty, reduce inequality and drive economic growth. Adequate systems of support need also to be in place to ensure that no one is left behind. That’s why the ILO and World Bank have launched a Global Partnership for Universal Social Protection . It aims to help countries reach all poor and vulnerable groups with measures to ensure income security and support to all people when needed, throughout their lives. This includes making pensions, maternity, disability and child benefits, among others, available to everyone, closing the gap for hundreds of millions currently unprotected worldwide. Placing decent work and social justice at the core of policymaking is simply a recognition of the obvious; none of us can build a better future for ourselves unless we include others. For proof – we hardly have to look beyond today’s headlines to find cases where the denial of the basics of social justice have created threats to peace, stability and development. If too many people in any society feel that they are being left behind, there is a strong chance that disruptive forces will undermine growth and destabilize social and political harmony.